That was why disciples which were nurtured by major sects and schools were far stronger than the average cultivator right from the start. They did not even start from the same starting line. Hence, everyone in the City of Man wanted to send their younger generations into Sacred Mountain to get the best training. Terrifying aura rampaged in all directions. Su Yi being right in front of him took on the full brunt of the aura as pressure pushed down on him. But at that moment, the aura in Su Yi started to awaken and move, radiating light which was getting brighter and brighter by the second. The fierce and sharp aura which did not allow disobedience began to become thicker and thicker. Feeling the atmosphere in the plaza, everyone started to quieten down. Anyone could feel the tension in the air. One was a disciple of Sacred Mountain, a prodigious being. Another was the jinx of the city. Always being called a jinx by people, returning after three years as a totally different person. Now, these two kinds of youths were having everyone quivering with excitement, holding their breath in anticipation. Ji Chao spoke, his face ferocious. Cracks started appearing on the floor of the plaza. Some parts of it even turned into dust. As he finished his sentence, the black Yuan Qi enveloped Ji Chao’s hands and flowed around them like black liquid. Flowing from his palm and finally ending in front of his two hands, forming a black colored ring of light several meters wide. The black light was so condensed that it gave a feeling of immeasurable vastness like it had turned into an unmovable mountain. As he put his foot forward, Ji Chao completed his hand seal. A powerful aura permeated the space around him causing the ground to tremble. A cold and deep voice came out from Ji Chao’s mouth. The humongous black ring of light which looked like it was almost solid, exploded. Black Earth attribute Yuan Qi surged in every direction like a tidal wave, bringing with it sounds of the air trembling across the space as it encroached on Su Yi. The black ring of light covered a huge area. Wherever it passed, the grounds of the plaza would shatter and be blasted into the air. Seeing Ji Chao’s attack, he had used all his strength and that was horrifying. The people with sharp eyes could tell that someone at Yuan Xuan Realm First Grade may not be able to take on such an attack. Now that Ji Chao had attacked without holding anything back, the faces of Su Yu Tian, Su Jing Ting and the rest were as serious as it could be. Everyone’s eyes were closely following the fight, not daring to even blink and gasped with worry for Su Yi. At the same time, the target, Su Yi, could feel it very clearly how strong the attack was. The expansion of that black ring of light covering the entire plaza was like a great mountain bringing with it tons of raw power crushing everything in its way. But it was because of this that Su Yi’s “Supreme Chaotic Yuan Technique” started to run amok and produced an aura. An aura which did not allow anyone to challenges its rule. That aura was overbearing and sharp, majestic and destructive! A crimson fire raged in Su Yi’s eyes. The brimming Yuan Qi in his meridians were boiling, expanding the already wide meridians even further. From the surface, it looked like many tiny snakes crawling through under his skin. There were even faint sounds of thunder and raging winds roaring from Su Yi’s body. Su Yi roared, his arm shook, and he threw a fist in front of him. Su Yi’s fist was enveloped in blinding light like there was a layer of solid light on it. With the most tyrannical and swift method, he directly threw a punch out. There were no retreats in this confrontation and following Su Yi’s action, the two attacks collided. This collision, under the astonished gazes of the spectators, caused an explosion of raging winds as if a boulder was thrown into the water. The winds rippled out quickly and violently. Tiny cracks started appearing on the floor of the plaza like a spider’s web. This collision filled the hearts of people with spirit! A fight between two youths could actually cause such an uproar! Everyone’s mouths were agape and stunned due to the shock. But this collision only lasted a while before the layer of Yuan Qi on Su Yi’s first could not handle the pressure of the black ring of light and started showing traces of cracks. Afterward, it exploded and was shattered completely. “Is Su Yi going to lose? !” The eyes of the experts of the five big families were trembling. The difference in cultivation was too big. The gap was too wide to fill. Su Yi could never win. 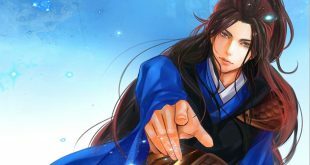 “Su Yi being able to produce such an aura is already unbelievable!” With Su Yi’s cultivation level of Yuan Soul Realm First Grade, he was already able to fight like this with Ji Chao to such an extent, how could he have the talent of an errand boy? He was already not as simple as he looked. Seeing how the layer of Yuan Qi on Su Yi’s fist had already been shattered, Ji Chao sneered. A streak of cold light flashed in his eyes, bloodlust gushing out of him. Ji Chao had fought with all his might since he had already intended to kill. This brat dared to injure him, no matter what, he could not let him off. Suddenly, at this moment, a horrifying light surged out from Su Yi’s crimson red eyes. Su Yi could clearly feel that in that moment of time, the mysterious sphere of light in his mind was glowing, a strange power diffusing out from it. This strange power was more like a signal, triggering all the Yuan Qi in Su Yi’s Dantian to flow through his entire body. This power was also like a guide, moving the Yuan Qi in Su Yi’s body in a special manner. Every time it went into a new meridian, the Yuan Qi seemed to become even more tyrannical and powerful, at the same time causing Su Yi’s meridians to be on the verge of exploding. If not for the three years of forging, Su Yi’s meridians had no way of withstanding such powerful Yuan Qi. In an instant, the Yuan Qi in his meridians all gathered on Su Yi’s right fist. Su Yi’s meridians were already filled to the limit. As if it was going to burst any moment. The intense pain caused his veins to appear on his face, making him look even more ferocious. All the Yuan Qi in his Dantian converged on his fist. The layer of Yuan Qi which had been shattered was restored in the blink of an eye, radiating with intense light. Concurrently, Su Yi roared. From within his fist, a wave of terrifying Yuan Qi erupted like a volcano as it exploded out of the fist. At that moment, under the eyes of all, Su Yi’s fist enveloped with light seemed to have expanded. With crisp sounds of wind and thunder, like the rumbles of a great storm, they resonated, giving off a feeling that a tyrant had just been awakened. The authority and majesty of an emperor descended upon the place, bringing with it an aura of destruction. At the same time, there was a feeling that space was being ripped apart in the plaza. A violent force exploded as Su Yi’s and Ji Chao’s fists collided. The furious winds turned into a wave and shot wildly in every direction. The furious winds swept across the place like a hurricane, causing the young men and ladies in the area who were closer to the stage to stagger backward.